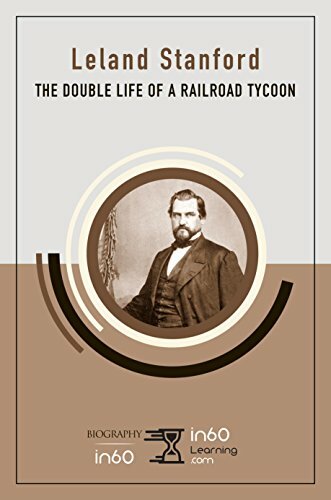 In 60 minutes learn why Leland Stanford lived a double life. Leland Stanford retains a double legacy as both a robber baron and a great philanthropist. He got his start in business as a merchant during the California Gold Rush, but he worked his way up to president of both the Central and Southern Pacific Railroad companies by 1861. He became a railroad mogul, a leading force in an under regulated industry wherein he gained a reputation for corrupt and greedy practices. Yet, he and his wife benevolently founded Stanford University in memory of their deceased son. This biography unravels the complicated threads of Stanford’s life, showing how in some ways the man operated just like the machines of his business empire, and in others, he was as human as the rest of us. Leland Stanford, born in 1824 in New York State, was the founder of the prestigious Stanford University in Palo Alto, California, opened in October of 1891 as a way to honor and memorialize his son. The town/city of Palo Alto began as a "community" for his 100 beloved horses who were moved from one place to another in a special train car built for their comfort! He was immensely rich, much of that due to shady business deals. On the other hand, he was a generous benefactor to charities of his day. As a man of many talents, he practised law for a while, opened grocery stores, was closely involved in opening the West through the railroad, and ran for political office. He was a complicated, taciturn, often misunderstood man to friend and foe alike. He died at the age of 69 having accomplished so much in his lifetime. I love the concept of learning provided in a book readable in 60 minutes. The writing style of this book is concise, detailed, and informative. In our busy world there is no better way to learn so much in so short a time. I wholeheartedly recommend the in60Learning books that range from biographies, to histories to audio books. Fantastic! Sandra Olshaski's disclosure: Thanks to Tyler from in60Learning.com for sending me this book for review. I was not compensated in any other way, nor told how to rate or review this product. Get smarter in just 60 minutes with in60Learning. Concise and elegantly written non-fiction books and audiobooks help you learn the core subject matter in 20% of the time that it takes to read a typical book. Life is short, so explore a multitude of fascinating historical, biographical, scientific, political, and financial topics in only an hour each. Visit in60Learning.com. I like the concept of learning a new subject or about an historical figure in only one hour. I hadn't heard of Leland Stanford and this one sounds like an interesting read. I like the idea of reading a book in 60 minutes. Great post!